"Now, let me write a poem that resonates with the seventh sense." Midori Osaki was a woman writer who was born early in the 20th century in Tottori Prefecture, far away from Tokyo. Around 1930 she wrote such unique novels as "Wandering in the World of the Seventh Sense" (Dainana kankai Hoko), "Miss Cricket" (Kohorogi-jo) and "Walking" (Hoko), but in her mid-thirties she became mentally deranged from addiction to painkillers. Her family immediately brought her back home, and she never wrote again. 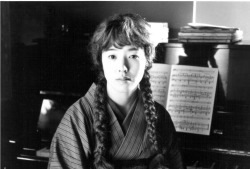 Although Osaki had been described as a tragic genius and a minor woman writer by some male critics, from the beginning of the 1990s, female critics began to re-read her from the perspectives of gender, sexuality, women studies, and modernity. The film "In Search of a Lost Writer: Wandering in the World of the Seventh Sense" depicts the life of this "phantom writer" and dramatizes her best-known novel, "Wandering in the World of the Seventh Sense." In preparation of the film, I interviewed her relatives and acquaintances, and finally came to believe with confidence that the latter half of Osaki's life was very different from the commonly imagined "miserable feeble life of a writer who gave up writing." For her, life meant more than just writing. Osaki also seemed to have also found pleasure and significance in her beloved hometown. 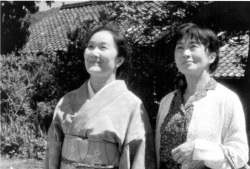 The film consists of three parts: a reassessment of Osaki's life and work in a contemporary setting; a dramatization of her fascinating and somewhat mysterious life story, traced backward from her deathbed to her youth; and an adaptation of her novel, "Wandering in the World of the Seventh Sense," in which a young heroine from a small town comes to Tokyo to live with her two brothers and falls in love with one of their fellow students. In this novel, the heroine Machiko looks for the world of the "seventh sense," surpassing both the conventional five senses of the human body and the "sixth sense." Here Osaki develops a world far from such conventional modern ideas as that human beings are the center of the world, that the arts should make much of individual personality, or that love should be based on heterosexuality. 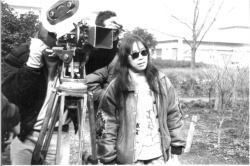 In realizing my dream to express Osaki Midori's world in film, Ms. Yumiko Matsumoto, a journalist from Tottori, Osaki's hometown, immediately leapt into action with a call for raising money. The campaign led to the collection of donations from over 10,000 people, mainly women, from Tottori as well as throughout the country. At first, Osaki was not well known even in her hometown, but in the course of making the film, all the residents of here birthplace, Iwami, supported us with great energy and compassion. In addition to this grass-roots support, the film also got funds from the Japan Arts and Culture Foundation and the Tokyo Women's Foundation. Midori Osaki (1896-1971) was a 'lost' author who suddenly disappeared from Japanese literary history in the middle of her career. Her best-known work is a unique novel, "Wandering in the World of the Seventh Sense" (1931), in which only moss grown as a scientific experiment suceeds romantically, while all the human characters are consigned to heartbreak or unrequited love. The year after this work was published, Osaki returned from Tokyo to her rural hometown, suffering from delirium caused by addiction to painkillers. She stopped writing in her mid 30s, and lost touch with her literary circle, which included the prominent female writer Fumiko Hayashi (1904-1951); soon she had been forgotten by all but a few people. It was not until 1969 that she was rediscovered, when "Wandering in the World of the Seventh Sense" was included in a new anthology. Her work made quite an impact on critics and readers, largely because of the timeless appeal of her refreshing, individual style. Soon afterwards, she was discovered to be still alive, in her 70s and living in her small hometown in Tottori. She passed away at the age of 74, two years after being rediscovered. Recently her works have grown increasingly popular among young women, to the extent that she is often regarded as an author of young women's comics (shojo manga) before her time. She has also been compared to contemporary female writers like Yumiko Oshima and Banana Yoshimoto. Popular Osaki stories include "Miss Cricket," "Walking," and "On the Way"; editions of her collected works were publishued in 1979 by Sojusha, and in 1998 by Chikuma shobo. Unlike mainstream, realist writers, Midori Osaki barely wrote about her own life. She thought of literature as the expression of a world of sensation beyond everyday reality and ordinary life, and considered the trivialities of her daily life and romantic involvements not worth recording. This abstention from autobiography may well have contributed to posthumously generated rumors and legends about her life. "it is so cruel that I die this way," with huge tears rolling down her cheeks. This widely circulated story came to serve as a symbol for her "solitary," "miserable" life. It is often said that the latter half of her life was spent "aging in vain," or that she was "half dead," but are we to take such notions seriously? Since around 1990, female writers, critics, and literary scholars have started to re-read Osaki. They depart from hackneyed images of her life, depicting her from a completely different perspective. 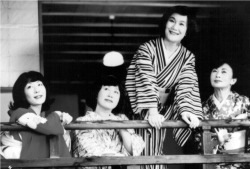 In the contemporary portion of the film, Sumiko Yagawa (poet and writer) said, "Osaki went to Tokyo, didn't get properly married, and was forced to return to her hometown. From a patriarchal male perspective, this was a disgrace, but she was beyond such limitations. For men, the notion of being a writer consisted of publishing works and making a name for oneself. But Osaki did not choose to become a professional writer, tied so strongly to the idea of worldly success. She saw humanity, society, and the universe from a much wider perspective. Later in her life she looked after her nephews and nieces. From the male viewpoint, it was pitiful for a former writer to be performing such a task, but I believe that she viewed her nephews and nieces and the world of her writing equally. Her literary works did not become well-known, but she was loved and respected as a reliable aunt. I think that was equal to what she conveyed in her writing." Sachiko Kato (writer), who also appeared in the contemporary portion of the film, pointed out how far ahead of her time Osaki's philosophical perspective was: "I believe that in our minds there is a sensation that the generally perceived boundary between men and women disappears. Once we step into the World of the Seventh Sense, the most taken-for-granted beliefs of our daily lives fall apart, and all boundaries began blurring. Though Osaki's novel is written with the utmost delicacy, it is laid-back, and filled with a nostalgic atmosphere that excites our yearning for the past. It is a quiet, calm work, but even so, I believe that it is a mass of radical ideas that smash the existing order, and the boundaries that were created to maintain order." In this film, we wonder how far we were able to grasp this 'aerial poet' who, though seemingly confined to the land of Tottori, set out to visit the solar system, riding on a pale breeze on a clear autumn day. Domestic Distributor and International Sales Company: Tantan-sha Company. Non-Theatrical Screenings Rights Holder: Tantan-sha Company. Libraries Holding Screening Tape of Film: Toei Kagaku Company. The 22nd International Festival Films de femmes de Creteil (competition); and more.